There’s a nice mix of cast skeletons and skulls and digital interactive things, and to me the clear winner on the digital side of things was this giant touch table where you match up little walking tyrannosaurs with their place on the tyrannosaur family tree. If you mess up too many times, your tyrannosaur explodes into tiny steaks! And when you complete the tree, a meteor shower destroys all your work! Madness!! One of the first tyrannosaurs we get to meet is Daspletosaurus, a classic but lesser known tyrannosaur from Alberta. This is a really fun pose, and I like the inclusion of gastralia, which are often omitted from theropod skeletons for some reason. I also got to see a mounted skeleton of Scotty the Tyrannosaurus for the first time! I visited the T. rex Discovery Centre in Eastend, Saskatchewan almost 10 years ago, when Scotty was still undergoing preparation. This is one of the most complete tyrannosaur skeletons ever found, and may be the heaviest. Standing next to this fellow really hammers home just how big Tyrannosaurus was. A real treat! We also get to meet some of the newer tyrannosaurs, learning about their evolutionary history along the way. 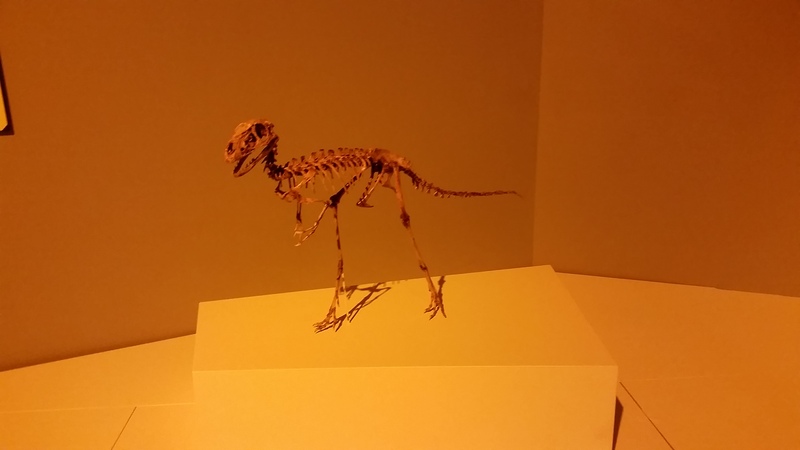 Tyrannosaurs, like many dinosaurs, started out small, and we’ve got the Dilong to prove it. And while I don’t totally love this reconstruction, I do love that bizarro crested Guanlong is included in the exhibit, and that there’s some fluff on it (feathers and fluff are highlighted elsewhere in the exhibit too), and I like mixing up skeletons with dioramas, so there you go. 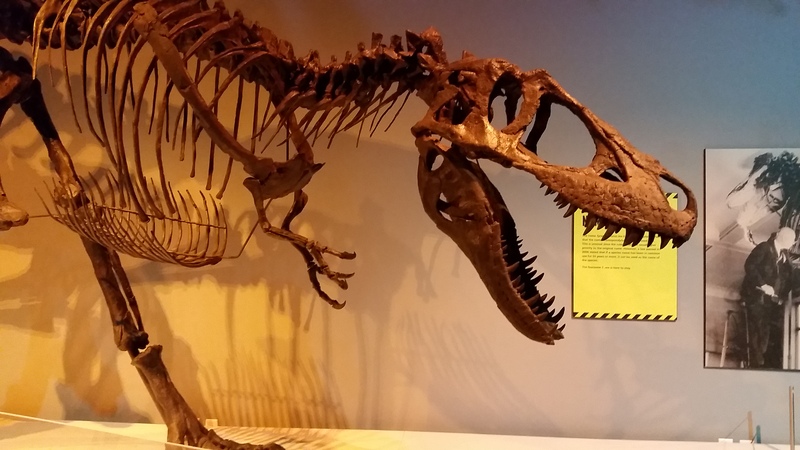 Tyrannosaurs: Meet the Family is on exhibit until April 30th and is well worth a visit! You can also download their free tyrannosaur egg-hatching app (which requires less walking than Pokemon Go! ), which is a fun addition to the exhibit for before or after your visit. I think I saw this in Sydney a couple of years ago?